The emergency exit at the rear side of Arpit Palace Hotel in Karol Bagh had its shutter down and was locked from outside. New Delhi: Early this morning, before dawn, a fire spread through the two top floors of a budget six-storey hotel in a congested central Delhi area, killing 17 occupants, including a child. 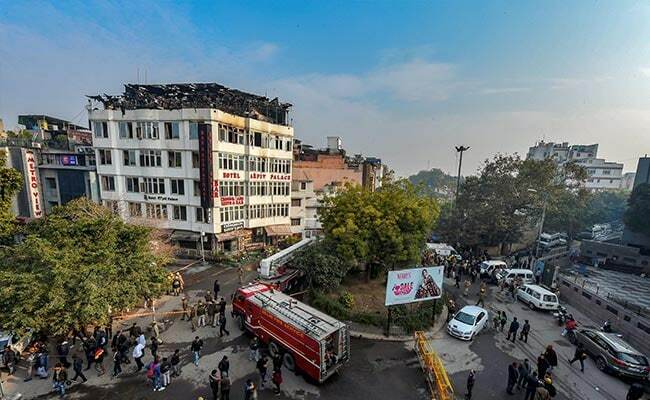 As thick smoke and flames rose from the top floor of Arpit Palace Hotel in Karol Bagh, two died when they jumped off the building in a desperate attempt to save themselves. Officials said nearly all rooms of the 65-room hotel were occupied when the fire began at 4 am. The cause of the fire that started on the second floor is not known yet, though it is suspected to have originated from a short circuit. Illegal construction: Even though buildings in the area have a four-floor limit, this hotel had ground plus four floors, and the roof had been converted to a restaurant, with a canopy covering it, effectively making it a six-floor building. "Apparently, there were lapses (from the hotel administration's side). Action will be taken against those found guilty," Delhi Home Minister Satyendar Jain said. Wooden Panelling: The corridors of the hotel were narrow and had wooden panelling, which can catch and spread fire easily. Fire officials said these could have contributed to the fire spreading rapidly, and that is why guests at the hotel were unable to use corridors. Emergency Exit Closed: The emergency exit at the rear side of the hotel had its shutter down and was locked from outside. Officials have said the exit was supposed to be manned by a guard. "These are very narrow (emergency exits), not according to specifications. And they were closed at night. According to information we have, those gates are closed at night and a guard sits outside. But we don't know if the guard was there or not," Union Tourism Minister KJ Alphons told reporters after surveying the spot. Congested Area: The hotel is located in an extremely congested area in the heart of Delhi. Even though two dozen fire engines were sent to battle the blaze, they had difficulties accessing the hotel building from the backside. The first call was made to the fire services at around 4:30; it wasn't until 7 am that the fire was brought under control. A busy commercial centre criss-crossed by narrow alleys where electric wires dangle overhead, Karol Bagh houses hundreds of hotels, shops and offices, and is packed with tourists and shoppers.